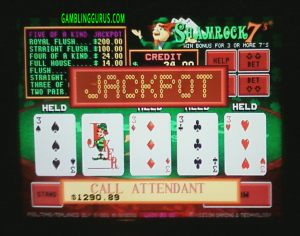 Shamrock7’s™ Video Poker by Vision Gaming & Technology is one of the most popular casino video card games that players will find in many Indian (Tribal Gaming) Casinos around the USA. 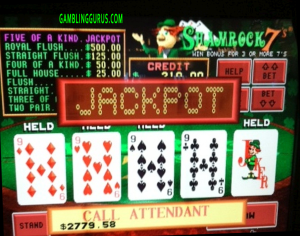 At one of the local Tribal Gaming Casinos we visit from time to time, it’s actually sometimes hard to find a seat on one of these Pot O’ Gold machines that offers the Shamrock7’s Card Game, mainly because of the game’s high popularity! This game is most definitely one of the most popular Video Card Games that has ever been placed on a casino floor! 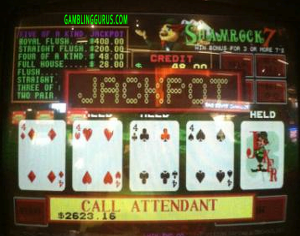 The Shamrock 7’s Game offers a paytable that’s similar in payouts to other video poker card games. The only real drawback is that a “Two-Pair Hand and Three-Of-A-Kind” hand only offer your initial bet back on the smaller denomination machines. On those machines you’ll need to hit at least “A Straight” in order to make a little on your bet amount. 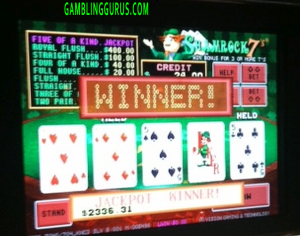 On the larger denomination machines the Three-Of-A-Kind Hand will double your Bet Amount back. Now, one of the fun and interesting aspects of this game is when you hit three or more 7’s for the “Pots-O-Gold Bonus Round”. 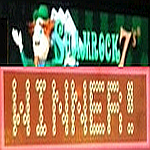 Once you hit at least 3-7’s the screen will change to the bonus round screen where the player will get to choose one Pot O’ Gold from the three Pot’s offered. If you choose the right Pot you can win up to 30X your bet amount in this bonus round! You can see a few examples of this bonus round in the YouTube Video we’ve posted below. Most if not all of these Pot O’ Gold Games are networked into other machines within the same bank of machines, up to 32 machines can be networked into each other. 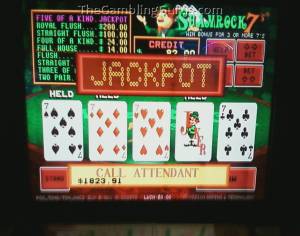 This is the main reason that the “Shamrock7’s Progressive Jackpot” climbs so fast in value! 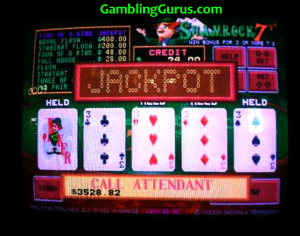 Once a player hits 5-of-a-kind on one of the machines, the progressive jackpot amount is won and all of the machines in that bank are then automatically re-set to the benchmark seed amount. Our Shamrock7’s Winning Screenshots! Click on pics below to enlarge. 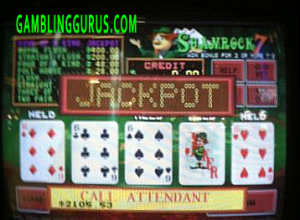 *Please note that these pics were made with a camera phone since digital cameras are not allowed inside land-based casinos in the USA. Some of the pics turned out great but a few of the others are not quite as clear but are still great pics! 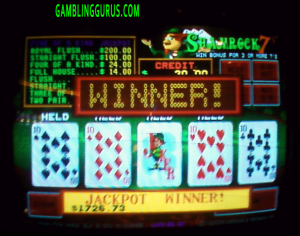 *Progressive Shamrock7’s Video Poker Wins – hit at: Harrah’s Cherokee Casino! Our Shamrock7's Winning Screenshots! Click on pics below to enlarge.